Beautiful wide brimmed Goldscheider painted Jug/vase in lovely pink by Myott. Myott Son & Co . England ,c1920s , Milk , Water ,Lemonade , jug . Myott Son & Co. England ,c1920s, Milk, Water ,Lemonade, jug. One small area of very light crazing to base, the main body of the jug is craze free. One very small glaze run on rim of spout, barely noticeable. LARGE SALAD or PUNCH BOWL. Photographs are for illustration only ACTUAL COLOUR MAY DIFFER SLIGHTLY FROM THE PHOTOGRAPH. A Unique find as it is New, Unused & in Original box. (Box does show signs of storage & age). Myott, Son & Co. Maker's mark Green transfer-printed and gilded decorative rim. One of a kind, original, hand-painted Myott & Son fruit bowl. Chip-free, but with a little crazing on the underside. 16cm high 12cm across brim. Art Deco hand painted Myott Son & Co Pyramid Vase in Excellent condition. Myott Sons & Co Primula Ware P9775 Decorative Cup and Saucer 1930 Floral Design Highest Quality Rare. Here for sale we have a nice item. ANTIQUE MYOTT. MYOTT AND SONS. GOLD CROWN WITH MYOTT STAMP AND ENGLAND WHICH DATES IT THE EARLY 1900'S. CABINET TRIO BY. HAND PAINTED. CONSISTS OF CUP, SAUCER AND PLATE. SAUCER IS THE AVON STYLE SHAPE AND HAS A DIA OF 4". New listingMyott Son & Co 14 piece tea set. Made in England between 1901 and 1921. Minor cracks in main dish and blemishes on saucer. Hand Painted Art Deco Jug H8301. In Very Good Condition. But Considering It's Nearly 90 Years Old. Fabulous Myott & Sons Art Deco Pyramid Vase. This rare hand painted poppy design is gorgeous. This genuine antique finger vase dates to the 1920's. The fan shaped vase is 8 1/4" (21 cm) high & 5 1/4" (13 cm) x 4" (10cm) across the top.The base is 4 1/2 " (11cm ) x 3 3/4" (9cm). COULD BE A NICE ADDITION FOR YOUR KITCHEN, SEE PICTURE. 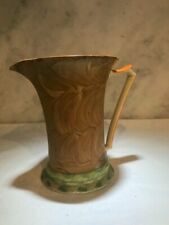 Fabulous Myott & Sons trumpet jug. The jug is 71/4" (18.5 cm) high & 4 1/4" (11 cm) across the top.The base is 3 1/4 " (8.5cm ). This rare hand painted art deco design is gorgeous. This genuine antique finger vase dates to the 1930's. Pretty Myott pitcher fresh from a local estate. A couple of glaze flakes on the rim. I never thought of it as a big problem since I only displayed it on a shelf. WE WILL ASSIST IN ANY CLAIMS IF NEEDED. 4" High to the top of the Handle and 4½" at the Widest Point. STAFFORDSHIRE ENGLAND. RARE MYOTT PATTERN. THE ONLY THING I'VE FOUND IS MYOTT LOST ALL THEIR PATTERN HISTORY IN A FIRE IN 1949. I CAN'T FIND ANYTHING ON THIS PATTERN ON THE WEB. Myott's Fine White Ironstone coffee cup and saucer. Made by Myott. Original art deco. Myott, Son & Co., early 1930s Corona (Imari) pattern, rectangular Sandwich Plate or Serving Platter. Beautiful red, floral and foliate design, on a contrasting blue and cream ground. We will always reply as quickly as possible, with an answer to your concern or enquiry. VINTAGE: MYOTT, STAFFORDSHIRE ~OLDE CHELSEA OVAL PLATE/PLATTER 37cm FREE P&P! OLDE CHELSEA. STAFFORDSHIRE ENGLAND. 37cm x 29cm. UNUSUAL LARGE OVAL PLATE OR PLATTER. RARE; Design with RED Circle to the Centre. UK Mainland Only. (May show minor imperfections from manufacture). For sale is a Lovely, Large, Myott Son & Co, Antique Blush Ivory Dish. under which is 'Myott Son & Co' and 'England' underneath. This is stamped underneath 'Imperial, Semi Porcelain', over a Crown. Please scroll down to bottom of listing for complete description and to see all pictures. Pictures are considered part of description so please enlarge to see best detail, thank you Hello, for your consideration is wonderfully detailed transfer ware sandwich tray featuring the Clopton Bridge in Stratford Upon Avon Details: Made by Mayott Son & Company Hanley Marked on back Shakespeare Land Collection Made in England Made of ceramic with raised flower design on sides Glazed finish Measures 12" wide X 6 1/2" deep Condition: Has no chips or cracks ~ Has allover crazing from age with some discoloration along craze lines Thank you for looking, God Bless you and have a beautiful day!. A Pair Of Myott 1930’s Cup & Saucer Sets. The gold decoration is bright and shows little sign of wear. The green back stamp shows a crown and reads SEMI PORCELAIN MYOTT SON & CO ENGLAND. This was probably made between 1910 and 1921. These plates will look stunning as part of period display or make a very elegant addition to your dinner or breakfast table. Numbered 8491. Rare (I can't find anything about these anywhere!). A decorative and rare sauce/gravy boat by Myott in the rose and ribbon pattern, this is a most unusual find and is in excellent condition and is complete with the saucer, circa 1900. Max wide13cm. 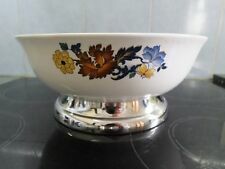 Rare Art Deco Myott Bowl and Saucer - Single Piece. Vintage Pottery. Dispatched with Royal Mail 2nd Class. 2 x Anne Hathaway's Cottage Plates. Myott Son & Co, Hanley, est 1880. A superb Art Deco period jug from Myott, Son & Co, to the base is 2684 F, BY 24, Myott, England, in good condition, size is 200 mm, 8" tall. MYOTT SON & CO. Pattern - 1807. Colour - cream background with Pink / Yellow / Green Flower / Bird pattern detail. Free bowl a chip to rim - see photo 1 (bottom bowl - right side ) and photo 6. Cup 7 cm high x 8cm wide (rim)/ 3cm (base). MYOTT SON & CO LTD. Signed - H Latham. Design, Gilt Edge and Colour – detailed, shiny, clear and bright. image of crown. Colour –cream background with green band a and gold filigree pattern and inner area multi coloured flower bouquet detail. BY MYOTT SON & CO. HAND PAINTED ART DECO JUG. MADE IN THE EARLY 1930s. BROWN, ORANGE & YELLOW. HAND PAINTED IN. Myott Gravy Tureen Rialto Iron Stone Ware. Myott Gravy Tureen Rialto Iron Stone Ware , made in England very attractive design in great condition no cracks or chips been in cabinet on display for many years, no sign of much use, picture of underneath showing full makers details. ART DECO MYOTT & SON PIERROT AND COLUMBINE VASE IN PERFECT CONDITION. MYOTT & SONS GOLD STAMP ON THE BASE AND MARKED HW 440. HAND PAINTED IN GREENS AND GREYS. WIDTH 11 CM.